Do you plan to make the wildlife and animals part of your wedding theme? Start with animal theme wedding magnets. 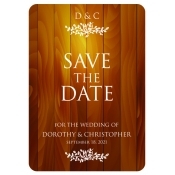 Sending out theme wedding invitations is the perfect way to announce your great day in style. Save the date magnets in animal prints will set the mood for an African safari, zoo and wildlife themed wedding. People will easily retain exotic themed wedding invitations on their refrigerator door and prepare themselves for the big day. Avail free full color printing on all personalized magnets. Theme weddings are gaining popularity because couples want to avoid monotony of a mundane church wedding. The wedding is a once in a lifetime affair and people want to enjoy it to their fullest permissible limits. They are coming up with fancy themes every now and then because it gives them reasons to make their union a once-in-a-lifetime affair. Wildlife is a very interesting theme for a wedding and many people are experimenting with it. No wonder, personalized animal themed wedding save the date magnets are becoming one of the hottest pre-invitations on the block. As you may agree, sending save the dates at least couple of months before the big day is an accepted thing. 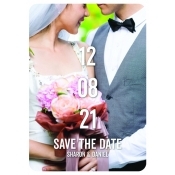 These invitations actually help people to save their dates and prepare themselves for the big day. Animal printed save the date magnets will work great for people who are planning to host African safari theme weddings, zoo themed weddings and any other wilderness themed weddings. They can position their visuals and venue information in full color on these magnets. 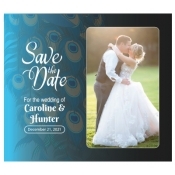 Our present selection of customized animal themed wedding save the date magnets are the most ordered items which are developed on various sizes of rectangle and square magnets. If you wish to make it more enchanting and animated, feel free to select from typical custom animal shaped magnets, die cut magnets, oval magnets, circle magnets, etc. We offer benefits of free full shipping, free online design proof and free art setup. This means customization is free of the cost. We may not be at par with any good wedding planner but we can help you in designing these customized magnets from scratch to set the mood for the main day event. This means we can design a save the date magnet from scratch at zero cost. If you already possess an artwork, feel free to share it with us at art@CMagnets.com or upload it at the end of order check out page. For more details, feel free to call us at 855-762-4638 (Toll Free) or write to us at info@CMagnets.com.